If you are looking for How to make cocoa powder at home then ideally you can’t because the beans are fermented, dried, roasted and cracked. Post that, the nibs are ground to extract cocoa butter, leaving chocolate liquor as a residue. After drying again, the mass is ground to a fine powder which is your cocoa. A soft, rich and gooey chocolate cake is surely irresistible and can be eaten right off the oven. Top it with ice-cream for creating a sinful dessert, decorate it with your favorite icing for a Birthday Party, or use it to make layered Cakes and other similar desserts. To make eggless cakes, you can use substitute eggs with ingredients like oil, butter, curds, rava. The tempting chocolaty flavor is all because of the addition of cocoa powder. Another favorite among children and adults & quite popular these days is the molten lava cake. The sight of chocolate oozing from the center of the cake is enticing in itself. Chocolate Brownie recipe with cocoa powder and eggs is an amazingly sinful dessert, you can relish it as it is or simply top it with ice-cream and drizzle some hot molten chocolate sauce. If you are looking for a vegan recipe then this Eggless and Dairy Free chocolate cake is what you must try. Loaded with healthy fat and the goodness of coconut and unsweetened cocoa, the Chocolate Coconut Healthy Vegan Dessert is another dessert you can indulge into guilt-free! 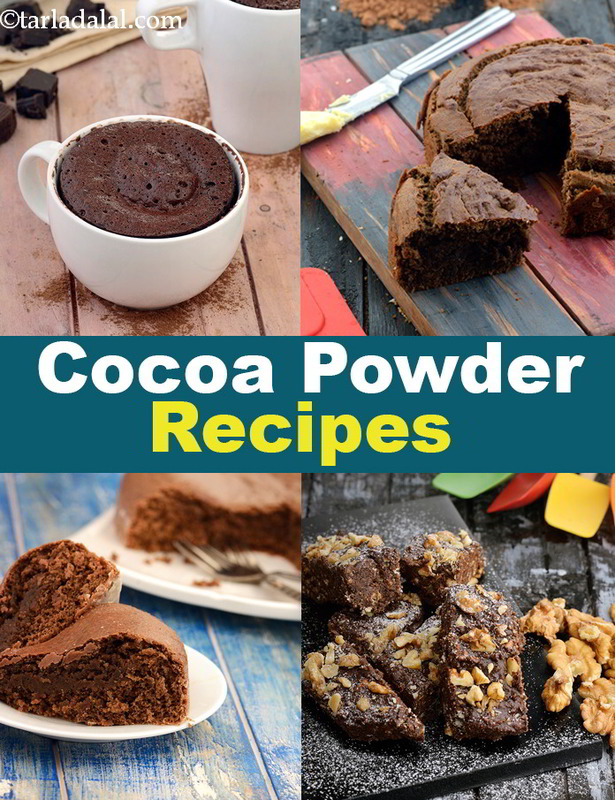 Our website also has many recipes for the Homemade chocolate recipe using cocoa powder. From decadent Chocolate Truffles, Date and Nut Coconut Cocoa Balls to Healthy treats like the Brazilian Nut Chocolate Balls, Peanut Butter Coconut Balls which you can make in advance and munch upon when hunger strikes, the list is endless! Boxes of chocolate fudge and walnut fudge are must while coming back from Lonavala. What if we tell you, you can make those rich, chewy fudges at home! Yes, just by combining together all the readily available ingredients and cooking them for some time, you can make Chocolate Walnut Fudge, Fudge Fingers, Chocolate Walnut Fudge Balls at home in less than 12 minutes. What are monsoons and winters without a hot cup of hot chocolate and what are summers without a glass of cold cocoa milkshake ? ! The flavor of these beverages totally depends upon the type and amount of cocoa powder used. Cocoa powder is also used to flavor many traditional Indian sweets and give them an innovative twist. Surprise your friends and family with joyful delights like Chocolate- Vanilla and Orange Sandesh, Chocolate Sheera, Pista Choco Roll. These are some easy recipes with cocoa powder without oven! Surprise your kids with these chocolaty treats early in the morning. After all, who doesn’t love chocolates! Chocolate Eggless Sweet Crêpes, Chocolate Pancakes with Whipped Cream and Nuts is something they would devour digging into. An air-tight container filled with Chocolate Cinnamon Granola Mix comes handy to whip up breakfast in a jiffy. Cocoa powder being in powdered form, you can mix it with a couple of ingredients to make rich icing variants like Mocha Glaze Icing, Chocolate Glaze Icing, Chocolate butter icing are the perfect garnish for cakes, as they not only taste great but also look brilliant! Have a glance at our website to check more cocoa powder recipes, cocoa powder uses to make a wide range of desserts from cakes, muffins, loafs to biscuit, cookies and chocolate balls. A variation of the curd-based eggless chocolate cake recipe that can be made easily using the microwave oven. The beauty of this pudding is that it is made without using gelatine. This yummy eggless chocolate cake made using a mix of butter and oil is super soft and can be the starting point for many fascinating desserts. Small Eggless Chocolate Cakes are moist and delicious in every bite and are perfect to serve as an evening tea snack. Serve with just a sprinkling of sugar or decorate with your favourite icing. Chocolate and coffee compliment each other well in a dessert. I have used cocoa powder instead of fat-laden chocolate to make chocolate sauce for all you health freak. So relish this fusion once in a while without worrying about gaining extra kilos. Kebabs are a favourite barbecue food almost anywhere. The spice mixture gives the Mexican flavour. Rich chocolate cake topped with a tangy lemon mousse.